Showing 39 articles from June 10, 2015. LOUISBURG -- Town residents won't be facing a property tax increase in the upcoming fiscal year, but they will be paying a bit more for utilities. In a budget workshop last Thursday, interim Town Manager Mark Warren presented a proposed budget that maintains the property tax rate at 53.5 cents per thousand. The budget is to be voted on by the town council on Monday, June 15, during a meeting that begins at 7:30 p.m.
LOUISBURG -- The Franklin County Board of Education wrapped up its Monday night meeting learning that 20 more teachers, two assistant principals, a school psychologist and a central office administrator have added their names to the list of people resigning or retiring from the school system this spring. Unofficially, that brings the loss to more than 200 employees. A changing of the suit! LOUISBURG -- For the past 42 years, Joyce Green has brought smiles and candy to thousands of people during her holiday tours of businesses, rest homes, and just about everywhere else you can imagine -- dressed as the Easter Bunny, Uncle Sam, a Thanksgiving Turkey and Santa Claus and an angel. This spring, though, she did her best Statue of Liberty impersonation, passing her good-time torch to her daughter, Joyce Green McLeod. FRANKLINTON -- By slashing a position in the street and police departments, ramping up revenue projections and taking a bit from savings, town officials have presented residents with a budget that doesn't call for a tax increase. In May, commissioners and staff were looking at a roughly $100,000 gap in expenditures and revenues and an 11-cent tax increase to fill the gap. LOUISBURG -- Police arrested a Louisburg man accused of trying to set his girlfriend's house on fire, crashing a car into two homes in the process. Andraes D. Bryant, 26, of 115 N. Main Street, was arrested Tuesday night and charged with attempted first degree arson, assault with a deadly weapon with intent to kill, and damage to property. 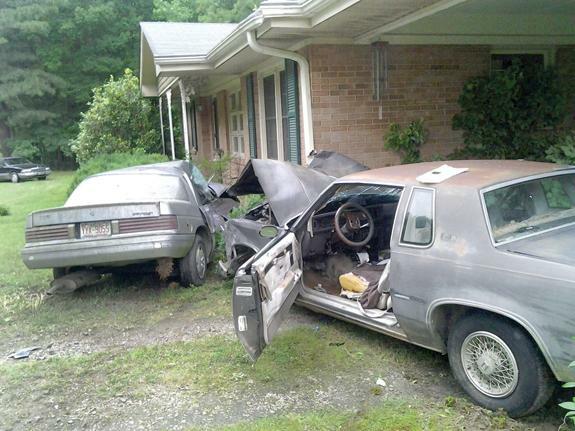 A Louisburg woman was charged with exceeding a safe speed after she ran off the road, struck a parked vehicle and then a house. 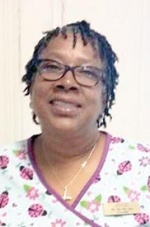 Following the June 4 accident, Shamar K. Williams was taken to the Novant Health Franklin Medical Center where she was treated for non life-threatening injuries. According to a report by Trooper P.L. Clayton, Williams, 28, was driving a 1984 Oldsmobile north on Hickory Rock Road at about 70 mph when she rounded a curve and went off the road. 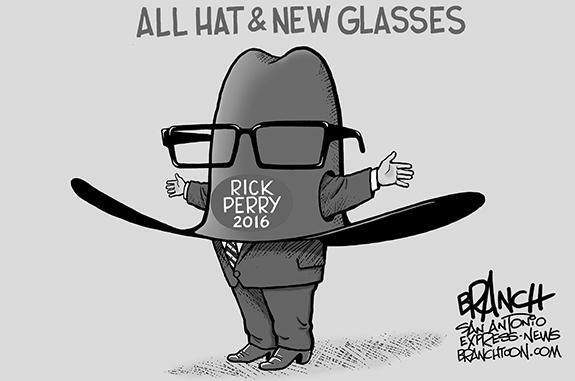 It's amazing how different local governments can be, even when they overlap. This year, the county has been thrashing about trying to deal with budget shortfalls, utility issues and expenses that seem to be growing on steroids -- so much so that residents saw fit to come out and offer "suggestions" on how to fix things. Then there was Louisburg where there will be no tax increase for something like the fifth year in a row and very minor increases for garbage collection and in water charges. 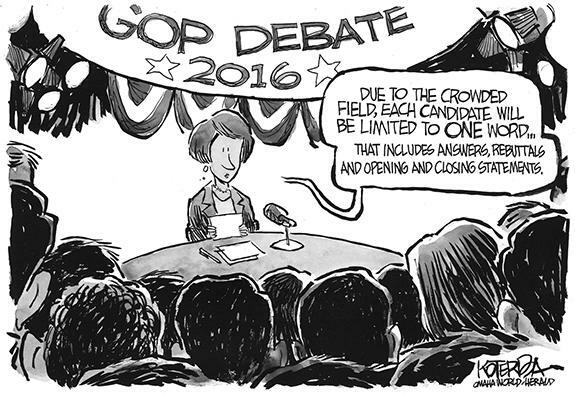 Leave it to the politicians (especially in Raleigh) to listen to facts and then entirely misinterpret them to favor their financial backers. Nothing could be clearer than a bill to freeze the state's renewal energy standard (REP) which is a mandate on how much clean energy a utility has to use. As someone who has made a routine of covering three high school graduations in one day, I smiled with incredible glee last week upon discovering that a Mississippi school superintendent pressed charges against unruly adults who interrupted a high school graduation there. The news prompted the expected response -- "How could you call the cops on parents who are just celebrating their kid's graduation?" Currently there is a flurry of legislative activity in Louisburg and Raleigh. In Louisburg, it is primarily the county budget, which is being aired in public hearings. In Raleigh there are a plethora of strange laws that are generating negative publicity for the state. We are told the state budget is being worked on, but as of this writing, it has yet to see the light of day. As the director of the Norris Theatre at Louisburg College, I was flattered and humbled to be mentioned by Pete Andrews in his recent letter to your paper as one of the many causes for optimism regarding Louisburg and its future. I have been trying to keep up with all the developments regarding the Franklin County hospital over the years both from a journalistic standpoint and one of personal interest, as that is where my mother died. BUNN - Funeral services for Deacon Henry M. Satterwhite Jr., 92, who died Monday, June 8, 2015, will be held at 3 p.m. Sunday, June 14, at Bunn Chapel Baptist Church in Bunn, with the Rev. Michael Richardson officiating. Burial will follow in the Satterwhite family cemetery. FRANKLINTON -- Coach Andy Stokes continues to accentuate local recruiting -- and that quest has paid off with one of the most talented Franklin County catches of all. 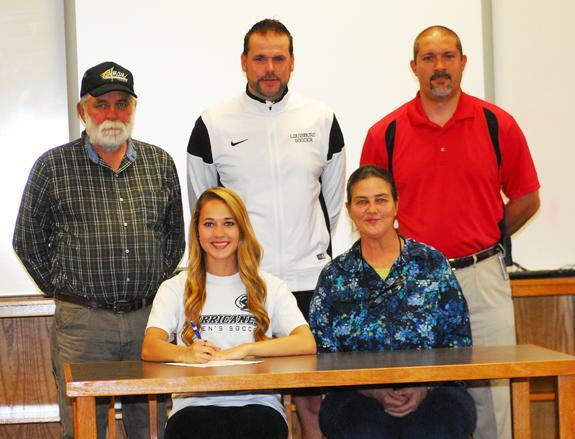 Franklinton's Hannah Rayman -- one of the top scorers in FHS and county history -- signed a letter-of-intent last week to continue her prolific career at Louisburg College. FAMILY EXCELLENCE. Twins (l to r) Emily and Will Stallings excelled in their respective sports during their outstanding careers at Bunn High School. The seniors will graduate this weekend. BUNN -- Born just 20 minutes apart, the Stallings Twins took divergent paths to the same destination during their academic and athletic careers at Bunn High School. 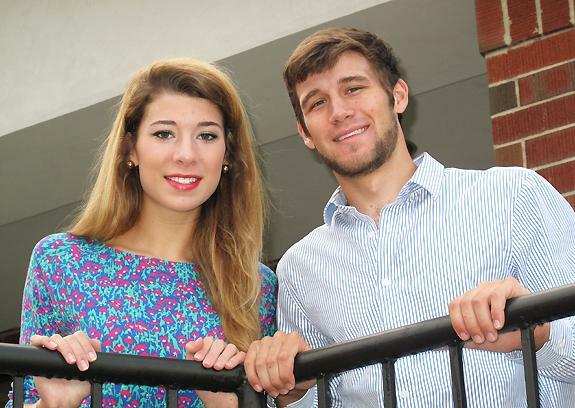 Emily and Will Stallings competed in different sports and often hung out in different circles, so it's understandable why it took so long for some people at BHS to realize they were twins, albeit not identical. WARRIOR PRIDE. 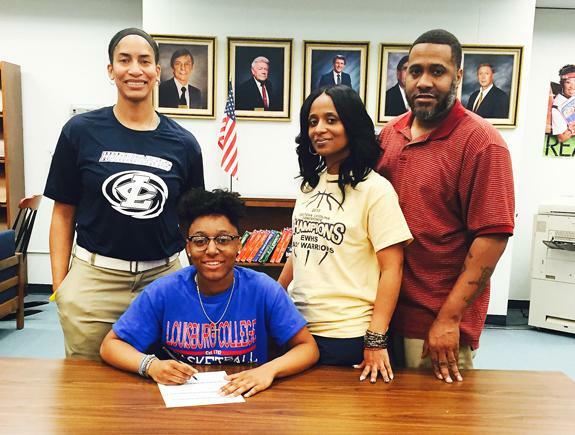 Jasmine Covington from Eastern Wayne HS is joined by her family and LC head coach Shay Hayes as she signs a letter-of-intent to join the Louisburg College women's hoops program. 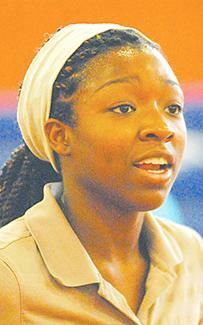 LOUISBURG -- Few junior college programs boast the expectation level of the Louisburg College women's basketball team. It's almost a given that the Lady Hurricanes will either reach or be in the mix for the NJCAA Division II National Tournament -- but that streak was broken last year with a semifinal loss in the Region X Tournament. "We went 21-7 last season, but it was disappointing,'' said LC head coach Shay Hayes, who just completed her second campaign in charge of the Lady Hurricanes' program. LOUISBURG -- The decisive final moments of last season's Region X Tournament Championship game continue to torment Louisburg College men's basketball coach Mark Vanderslice -- and serve as a relentless recruiting motivator. Vanderslice and the Hurricanes were on the verge of returning to the national tourney in 2014-15 after a one-year hiatus -- but couldn't execute down the stretch while dropping a tight finals contest to eventual national champ Richard Bland College. BUNN -- Charles Haley didn't know much about soccer when he took over as Bunn High School's head boys coach two years ago. But Haley certainly made an impact within the program before stepping down recently. Haley, a 2007 BHS graduate, is getting out of teaching and will be entering the private sector. His successor had not been chosen at press time. BUNN -- Baseball success is nothing new to Bunn High School, especially in recent seasons as the Wildcats have racked up their share of Northern Carolina Conference championships on the diamond. And the hits just keep coming for Bunn -- and don't seem to be on the verge of ending in the near future. BHS shared the NCC varsity crown this spring with eventual state champion South Granville. VANGUARDS' HEROES. 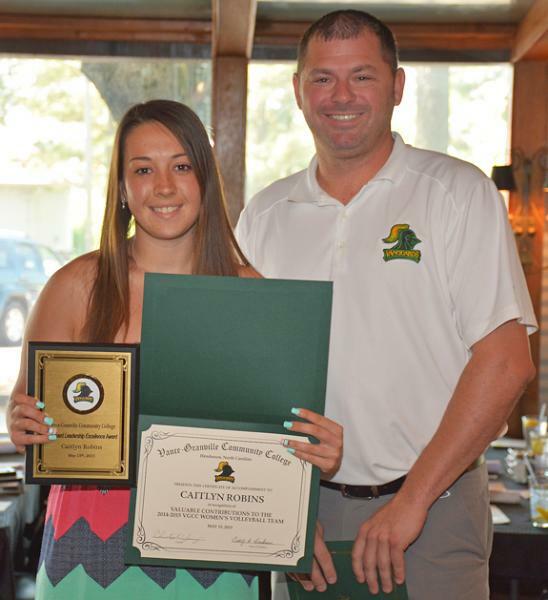 Among the honorees at the annual Vance-Granville Community College Athletic Awards Ceremony was Caitlyn Robbins. HENDERSON -- Vance-Granville Community College celebrated Vanguard student-athletes at its annual Athletics Banquet, which was held in May at Ribeyes Steakhouse in Henderson. Women's volleyball coach Christopher Young started the presentations of awards by recognizing his players. He presented the award for "Most Outstanding Player" to Kara Reese of Henderson. KERNERSVILLE -- Several members of the Franklinton High School track and field team took part in the NCTCCA Meet of Champions, which was held at Bishop McGuinness High School in Forsyth County. ZEBULON -- Joe Odom capped a wild rally in the eighth with a grand slam as the Carolina Mudcats came back from a late deficit to defeat the visiting Potomac Nationals 14-10 at Five County Stadium on Tuesday night in a Class A Carolina League baseball matchup. The Mudcats set single game season highs for runs, hits (19) and doubles (7) in the victory. LOUISBURG -- The Louisburg College women's soccer team, coached by veteran skipper Andy Stokes, will open its 2015 schedule Aug. 28 against Howard CC at a neutral site in Wilmington. The Lady Hurricanes will kick off their Region X slate on Sept. 5 at Spartanburg Methodist College before hosting their home opener Sept. 7 versus University of South Carolina-Salkehatchie in another league matchup. FRANKLIN COUNTY -- The Northern Carolina Conference is regarded as one of the state's most competitive Class 2-A leagues in boys tennis, but that didn't stop Franklinton's Corey Pender and Corbin Rednour from earning All-NCC accolades for the recently completed 2015 campaign. Pender and Rednour made the all-conference squad in doubles along with two other teams. 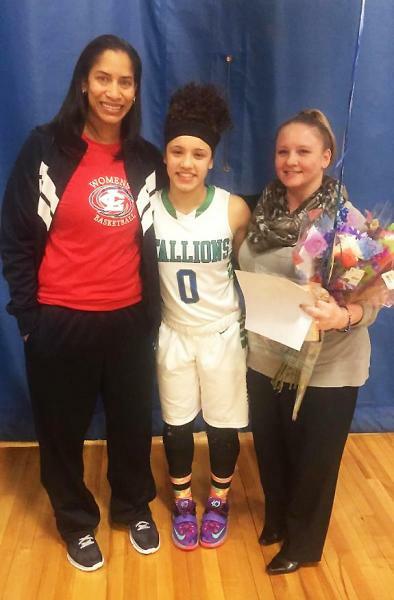 Whitney Campbell from Green Run High School has signed a letter-of-intent to play under Coach Shay Hayes (left) next season for the Louisburg College women's basketball squad. 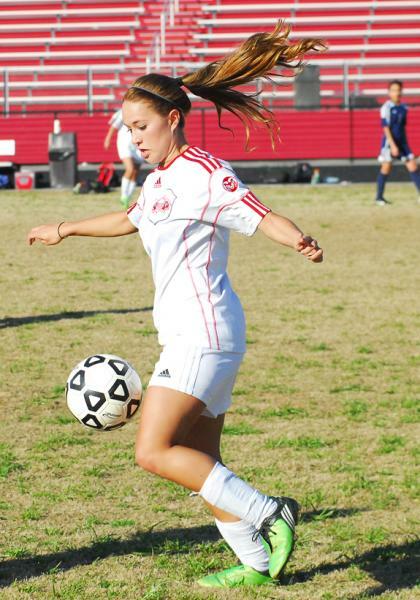 Hannah Rayman displayed plenty of ball skills during her soccer career at Franklinton HS. Franklin County natives Maylon and Dorothy Ferguson Cooke recently celebrated their 65th wedding anniversary. 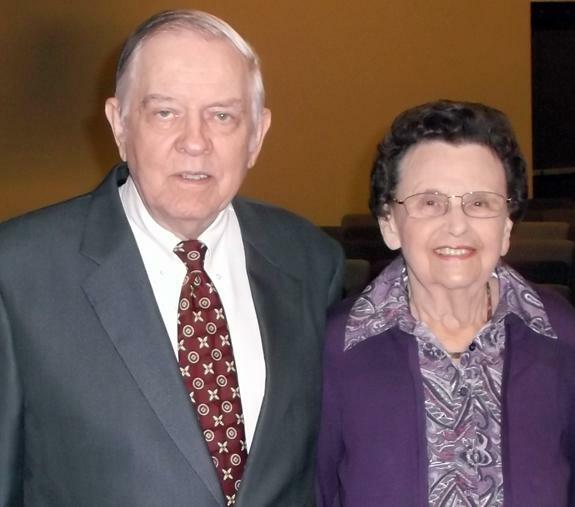 Married May 30, 1950 at Louisburg Baptist Church, the couple lived for several years in Louisburg before moving to Rolesville in 1959 where they raised their four children: Maylon, Cathy, Jerry and Stanley. They have also been blessed with four grandchildren. If we make the effort of not looking at the closed door, as we retire, but concentrate on the one that has just opened which reads "retired," our life is going to be much easier and happier. Many of us have had the opportunity to retire, or semi-retire, and have learned that many times, under these circumstances, we just have to learn to say "NO" so that we can enjoy family, friends, and ourselves. The spring concert season at Cherry Hill will conclude Sunday, June 14, with the annual student recital, performed this year by outstanding pianist Luke Fang. Each year a student is recommended by his or her teacher for consideration as the young musician of the year at Cherry Hill. This student must show unusual promise of mastery in his or her chosen musical field. Community health assessments are underway by the Franklin County Health Department. The Community Health Assessment is a foundation for improving and promoting the health and safety of a community, local officials said. These assessments are conducted every four years by health departments throughout North Carolina to identify issues that affect the health and safety of populations and determine the availability of resources within the community to adequately address the issues that have been identified. The Kerr-Tar Rural Planning Organization (KTRPO) adopted the Annual Planning Work Program (PWP) for Fiscal Year 2016 at the quarterly meeting on May 28. The adopted PWP is available at: www.ktrpo.com. The PWP is prepared on an annual basis to identify the planning priorities for the coming year and to define the planning work products and activities to be carried out by RPO staff. Franklin County Arts Council's Art Stroll, held last Thursday in Franklinton, attracted art lovers from all over Franklin, Wake and other surrounding counties. Twenty-four artists competed in the Members Only Art Show for the People's Choice Award. The winner was Jane Steelman with her painting titled Liam. 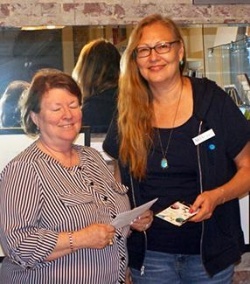 She received gift certificates for Michael's and Affordable Creative Framer as her award. YOUNGSVILLE -- Franklin County sheriff's deputies arrested a New York woman with Youngsville ties, alleging she was responsible for setting an apartment building on fire. An 82-year-old woman in the apartment suffered a heart attack during the event and died a few weeks later, according to reports. PILOT -- A neighbor dispute that included an alleged theft, death threats and a charge of assault on a female is slated to be heard in two different courts. Bobby and Jesse Ray took out warrants on May 29, seeking a temporary no-contact order, alleging that Harold Hayes Jr. was responsible for harassing, threatening and disrespecting them for the past three years and it has been escalating the past few months. Youngsville's options: To raise taxes ... or not! YOUNGSVILLE -- Town commissioners will be presented tonight (Thursday) with an option to adopt a budget that doesn't raise taxes or approve a spending plan that raises taxes by two cents to cover employee raises and the expansion of contracted planning and zoning services. LOUISBURG -- A Youngsville man was sentenced to more than three years in jail on a break-in charge, an arrest that resulted from a response to a domestic violence call. Brandon Sills, though, is still looking at more days in court on a number of unrelated charges. On Monday, Judge Carl Fox sentenced Sills to 17-30 months on the charge of possession of a firearm by a felon and between 9-20 months, to be served consecutively, on the charge of possession of stolen goods.